he Home Equity Line of Credit (HELOC) lets you split up your mortgage debt and borrow against your equity at low rates. The unique feature of this mortgage product is that you can slice the pie (the mortgage balance) into various segments. All of it is registered against the subject property title as just one charge. This gives you the ability to diversify your risk in the marketplace. If you had a $480,000 outstanding mortgage against a property (with 20% equity or a value of $600,000) you could divide it up into different segments. For example, you might place $200,000 in a variable-rate mortgage, $200,000 as fixed term and $80,000 line of credit. Spreading the risk across different markets helps you plan for the future, as there are different governing bodies controlling different aspects of the marketplace. Variable-rate mortgages and lines of credit (LOCs) are based on the prime lending rate and controlled by the Bank of Canada. Fixed rates are based on bond yields and dictated by the lenders themselves. Most other lenders follow the trends of the major chartered banks in Canada. There are two types of line of credit in Canada: secured (registered against real estate) and unsecured (guaranteed by one’s promise to repay). I can only assist with secured LOCs. The secured LOC means less risk for the lender as it is based on the market value of the home to a maximum of 80% loan-to-value. Therefor the rate is lower and the borrowing ceiling is higher. On secured LOCs the rate is Prime (2.70%) +0.50% which is 3.20%. This means that if you had a primary residence with a market value of $500,000 free and clear of any other type of mortgage then you could secure a $400,000 HELOC against it at 3.20%. Unsecured LOC rates vary depending on lender, but a safe starting range is 5-7%. And on unsecured LOCs, lenders tend to forward much less than secured LOCs; they range from $5,000-$40,000. Here is an example of a client I recently assisted. We were able to obtain a HELOC mortgage product from a Canadian charter bank. Current residence (located in the Greater Vancouver area) appraised at $1.15MM. Maximum loan limit, $920,000 (80% of market value: 1,150,000 x 80%). They opted to secure the current outstanding balance of $445,000 into a variable-rate mortgage at Prime-0.45% or 2.25%. The additional equity of $475,000 was set up for access across 3 different LOCs; one at $159,000 and two at $158,000. These clients now have access to $475,000 for any future needs: renos, emergency, investment opportunities, post-secondary education for their children. But while a HELOC allows for product diversification and long-term planning, it is not for everyone. It can be a bad idea if it’s just used as access to easy cash. One needs to possess high self-discipline, as the funds are extremely accessible. Using the home as a piggybank can backfire disastrously. A HELOC is also not available to all homeowners. There must be enough equity in the home before a lender will consider it. Please contact your Dominion Lending Centres mortgage professional to discuss the potential of structuring a HELOC mortgage product against your home. 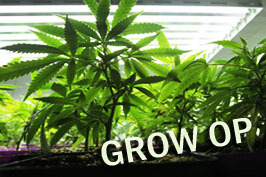 It is forever in discussion in the Lower Mainland – is a former grow-op home a good investment? Prices are often much lower than similar properties so at first glance it seems so. But the stigma will follow the property in perpetuity, unless it’s razed to the studs and rebuilt. If it’s been remediated that means it’s perfectly fine now, right? Not to the banks. This is an era where lenders are being very conservative with the Office of the Superintendent of Financial Institutions (OSFI) clamping down on policies. Prior to the sweeping mortgage rule changes that came into effect in July 2012 there were at least a dozen lenders with products for remediated grow-ops. That list has now been whittled down to about 5 credit unions in BC and a handful of private lenders. What you can expect from these offerings is that no matter how much you can put down or equity you have the credit unions are requiring mortgage insurance (CMHC or Genworth) so you will have the premium added to your mortgage and you can expect a 0.50-1.00% bonus added to the interest rate – not to mention an additional lender fee on top of all that in some cases. While the price of that home may be much lower than comparable properties without the stigma it can cost you in other ways. Lenders are being conservative with a view to the re-sale marketability factor. If the stigma will stay with that home forever, will there be many people willing to buy it if you decide to sell – or if that bank needs to foreclose and sell the house itself. Not to mention, with so few and costly financing options how many potential buyers will brave that process. Buyers that acquired remediated grow-ops prior to July 2012 who are now coming up for renewal are finding themselves with very few options. A recent client was hoping to secure a better rate, consolidate some credit debt and lower their payments was forced to simply renew with their existing lender at a higher rate than the rest of the market and it was just too expensive to tap into his equity. If you make the decision to buy a beautiful home with a dubious past remember to always ask one of the qualified mortgage professionals at Dominion Lending Centres to help you find the best financing. Can I Get a Mortgage Even with Bad Credit? You may be asking yourself if you’d be eligible to get a mortgage even with bad credit? The answer to this is quite simple, Yes! However, the type of mortgage you will qualify for will Depend on a few factors such as your credit profile, down payment, income, as well as a few other factors. Will I Qualify for a Bad Credit Mortgage in Canada? Since you probably already know that bank mortgage loans can be harder to achieve due to the level of risk you may present, you need to know that when banks aren’t an option there are other lenders that can help you, regardless of your credit or payment history. How Do I Qualify for a Mortgage in Canada with Less-than-Perfect Credit? If you are concerned about qualifying for a mortgage because your credit isn’t that great, don’t be. If you have the ability to prove your income and employment stability, and that you can afford it, there are secure loans that are specifically designed for you. However, you should know that as a high risk borrower you could be looking at mortgage rates between 5 and 20 percent. Therefore, it’s a good time to plan and save for your down payment well in advance to increase the chances of your mortgage application being approved. If you have a reliable co-signer with good credit history, this can also help you secure a lower interest rate and guarantee your approval. Before you make a purchase, you’ll want to sit down and figure out a set price range, including the minimum to maximum down payment you can afford and the overall property purchase price. If you’re not that great at crunching number, a mortgage professional can help. Even if you’re a borrowers with good credit, bad credit or no credit at all you can still qualify. Consumer proposal or bankruptcy, don’t worry even you can qualify. Mortgage brokers can be helpful in finding you competitive rates and terms due to their large financial network connections offering numerous borrowing solutions. This alone will save you a lot of time and money. If you’re a first time buyer with bad credit you’re wasting your time if you’re thinking of going to a bank or credit union to apply for a mortgage, they’ll probably say No. So, why not start with an alternate lender and use a mortgage broker to help you along your home buying journey.